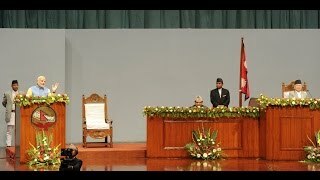 Indian Prime Minister Narendra Modi addressing the constituent assembly of Nepal. 14 AUGUST 2014 KATHMANDU – Nepal a piece of cheese in a big Mac burger of two giant populated and vast landscaped countries India and China in its borders. Nepal one of the poorest country in per ca-pita income where as annual per-ca-pita income is still below 1000 dollars which is mostly comes from donation, remittances and foreign aids is always in seeking some sort of cash in their hand though it is one of the richest in the world in terms of Natural resources, culture and its rich tradition. The issue that i am going to highlight here is the politics and its neighbors political affection towards its mainstream politics. Northern neighbor does not have much influence in Nepal’s politics but a huge support in infra -structure building and logistic support but south has done business in their profit always. As our culture and tradition along with the language similarity, we have long history of friendship and Nepal never own the toss in its hand. Nepali politician in this term are so poor to handle the situation and shameless in asking donation without improving anything inside the country for its people. Nepal build hardly some 500 km of roads in a decade. Nepali people has no proper electricity to light their homes. There is no certainty of having job which drive young enthusiast to flea the country in search of job. More than half a million youths are flying out to the gulf and East Asian country annually which is the main source of remittance numbering 500 billion rupee a year. Now here is the full speech of Visiting Prime Minister of India Shree Narendra Modi, where he did his best to vow is agenda and give Nepal a Thousand billion rupees as loan, which is a life long non ending term and may Nepal wont be able to pay back forever. In Our opinion, Was it a business that Narendra Modi did in Nepal? or was it the real help for the country that is battling for its ground politically and economically? The determination is yours. Just listen the full speech and Do write your comments below. We love to hear from you, let’s others to know your opinion and let others to hear you as well.